World population explosion, nuclear explosion, vehicular explosion, deforestation, habitation over mountains and in oceans, etc. have subsequently led through ages to severe pollution threatening the very existence of life on this globe. Costly pollution management technologies are not practically feasible. Hence, modern, cheaper, feasible biotechnologies which may perhaps cope with the varietal problems of environmental pollution have been evolved on a large scale. This book, Industrial Pollution and its Management, incorporates critical articles on various facets of industrial pollution and its possible management strategies. There are 19 chapters covering holistic information on the subject. 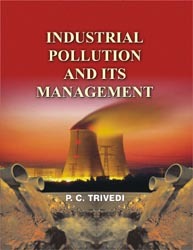 The book includes articles on management of chromium in industrial wastewaters; strategies for biological treatment of industrial wastewater; decolorisation and treatment of recalcitrant dye industry wastewater containing azo dyes; integrated eco-friendly management of solid waste of pulp industry; fluoride contamination and its remediation; and petha industry waste management by vermitechnology. An excellent treatise comprehends the latest information on biotechnology in pollution management. Articles on factory waste management, hospital waste management and bioremediation of oil pollution have added to the value of the book. This book will definitely serve not only as an excellent reference material but also as a practical guide for environmentalists, teachers, students and research workers.